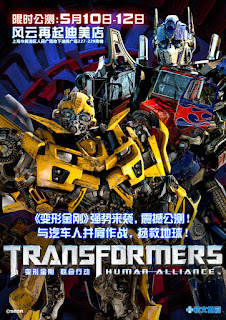 A few years ago SEGA released the Transformers Human Alliance game in various arcades. I haven't gotten a chance to play it, but maybe one day I'll make it out to a Dave and Busters to give it a whirl. As the game's trailer indicates, it's one of those crazy SEGA arcade gun games that always manage to be super fun and a wee bit insane. Seemingly the Autobots and Decepticons are fighting over a Cybertronian Fidget Spinner. I was watching random theme park videos on YouTube where I saw a special version that moves and flips with the onscreen action. I'd really love to play that version, but I don't see myself flying to Japan for an afternoon in a Sega Joypolis anytime soon. Though, I'm sure I could talk the wife into an evening at Dave and Buster's and play the standard version. Admittedly, it's going to be awkward with him staring at me like that. I recall when the game was released reading some negative responses over being movie and Human Alliance based (negativity online? go figure). 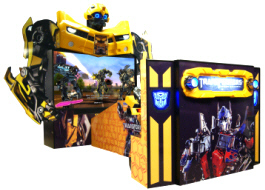 I can understand why some wouldn't like to play a human in a Transformers game, but seeing how it's a light gun game and basically a simulator ride type attraction, it makes sense to me. It doesn't hurt that I particularly enjoyed the Human Alliance series of toys. Basically, as a player, you're shooting at the bad guys while the Transformer races through all the craziness with you in tow. I could see myself getting a Transformers slush at Sonic (OMG, go get one, they're great) and plopping myself down at one of these for a few hours. Though if I was at Joypolis, I'd probably spill it. Considering how highly I regard the Universal Studios ride, I could see these machines parked next to the Supply Vault near the meet and greet with Optimus and crew. In fact, here I go again, creating my own ideal Universal Studios setting. Is this a type of fanfic? I dunno. But I can see it, there's the ride with that giant Optimus statue pointing out towards the Universal lagoon (talking Florida). There's the line que. Now normally the Supply Vault ride store is behind the ride, or you exit the ride into it. The meet and greet is just a little down from the Supply Vault entrance towards the rear. 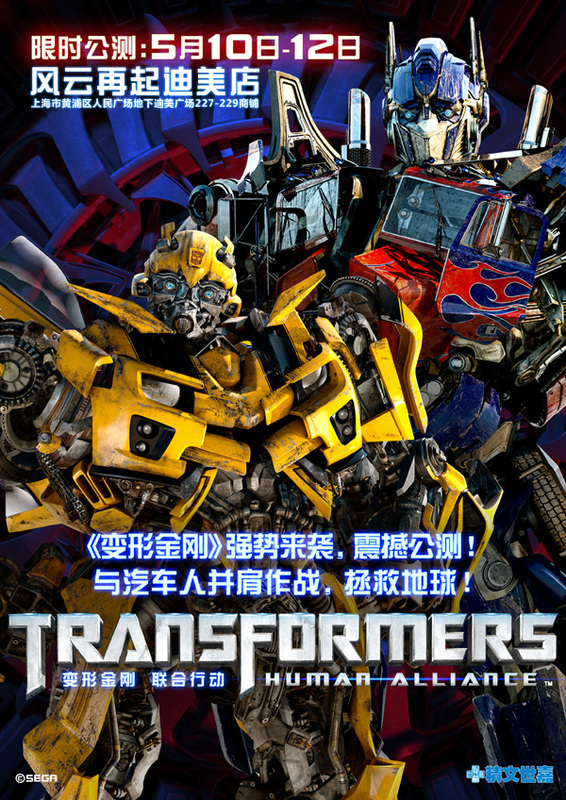 What if there was an additional building with the special version of the Human Alliance game and maybe a few stationary versions that also served Transformers treats. Such as Transformers drinks (like those bomb slushes they sell at Sonic right now) and snacks. Honestly, at this rate, I'm wondering why I'm not on the board at Universal.